Chelsea on the other hand slip to sixth with the scale of the defeat putting Sarri’s future in doubt. “I don’t know. You have to ask the club,” said the Italian when asked if he feared being fired just eight months into a three-year contract at Stamford Bridge. A 4-0 defeat to Bournemouth in their last away game was Chelsea’s heaviest league defeat since 1996. And this was their worst loss in any competition since 1991 after failing to recover from Raheem Sterling’s fourth-minute opener. 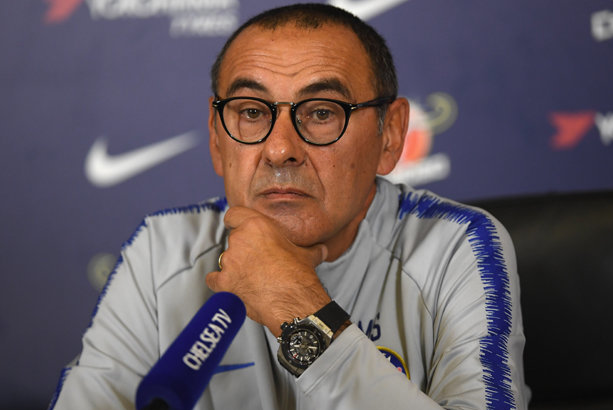 “We conceded the goal after four minutes in a stupid way,” added Sarri. The Catalan also suffered during his first year in charge, but always retained the faith of the club’s director of football and his former Barcelona colleague Txiki Begiristain before leading City to the title with a record 100 points last season. “My first year was difficult too. In some moments we played good but not this consistent. People expect the manager to arrive, buy players and it happens immediately,” said Guardiola. Liverpool maintain the advantage of a game in hand over City, but given a reprieve by draws for Jurgen Klopp’s men against Leicester and West Ham in recent weeks, the champions look determined to become the first side in a decade to retain the Premier League. But he need not have worried that would prove a costly miss as the Argentine made amends in stunning fashion by blasting into the top corner from 25 yards to double City’s after just 13 minutes. And Ilkay Gundogan’s shot from the edge of the area then had too much power for the world’s most expensive goalkeeper Kepa Arrizabalaga to compound Chelsea’s woes. Aguero completed his hat-trick from the penalty spot to move level with Liverpool’s Mohamed Salah as the Premier League’s top scorer on 17 for the season. Even after Aguero went off to a standing ovation, City’s strength in depth shone through as Gabriel Jesus, Riyad Mahrez and David Silva came off the bench. And Silva’s pass opened the visitors up again for the sixth as he picked out Oleksandr Zinchenko who crossed for Sterling to round off the scoring 10 minutes from time.